The model VSR-AT is an electronic vane type waterflow switch for use on wet sprinkler systems. It is UL Listed and FM Approved for use on steel pipe schedules 10 thru 40 sizes 2" thru 8". See ordering Information chart. 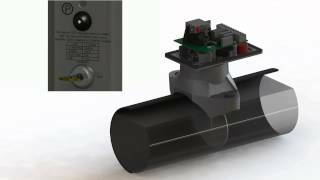 The VSR-AT may also be used as a sectional waterflow detector on large systems. The VSR-AT has two sets of alarm contacts and an adjustable instantly recycling electronic retard. The alarm contacts are actuated when a flow of 10 GPM (38 LPM) or more occurs downstream of the device. The flow condition must exist for a period of time necessary to overcome the selected retard time. 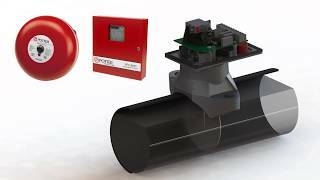 The VSR-AT may be remotely tested without flowing water by using the optional auto test Control model ATC-1 or ATC-4 or the use of addressable relays and monitor modules as part of a listed addressable fire alarm panel. 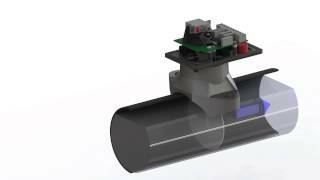 When the auto test feature is initiated, the VSR-AT performs a self test to ensure compliance with UL requirements regarding waterflow detection and retard time. In addition, the auto test feature ensures the integrity of the paddle/trip stem assembly. A successful completion of the auto test will activate both sets of normally open contacts on the flow switch. If the auto test detects a problem with the trip stem/paddle assembly or if there is no water in the pipe, neither normally open contact will operate and the flow switch will indicate a trouble condition at the test switch and transmit a trouble signal to the fire alarm panel.